Steiner Ranch is a very family oriented community. Most property purchased in the Steiner Ranch neighborhood includes a Property Owners Social Membership which includes access to three community centers that include two junior Olympic sized pools, a resort pool, splash pool, splash pad and two baby pools. Also located at the community centers are eight lighted tennis courts and four basketball courts. Residents have exclusive access to the Lake Club, conveniently located on Lake Austin, as well as seven parks and four multi-purpose athletic fields. There are also over 20 miles of serene hiking trails. Other membership categories are available, at additional cost. 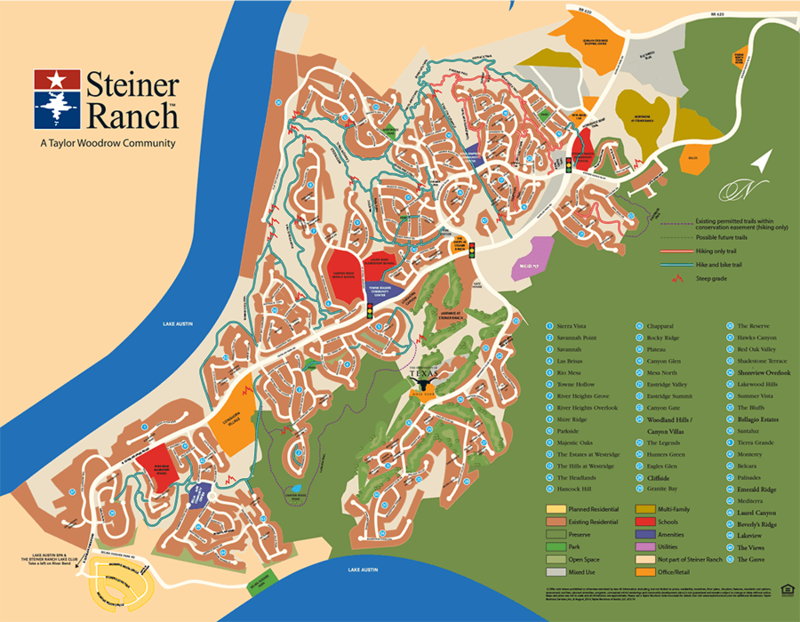 The average home size for the entire Steiner Ranch community is 3,500 sqft with an average sales price of $550,000. Home to the University of Texas men's and women's golf teams, this course has it all. Located in the hill country over the top of Lake Austin and bordering the Balcones Natural Wildlife Preserve, the views are spectacular. Also included is a state of the art practice facility. The University of Texas traditions and first-class experiences stand out with impeccable club amenities. As for the golf, there are many elevation changes and quite a few risk-reward type shots from the tee boxes and in the fairway. This course requires good course management and may take a few rounds before you get the hang of some of the layup shots. The final holes on the back 9 always make for good competition when everything is on the line. *Other levels and benefits available. Want to View More Golf Communities? Nicole Cooper © 2019 All rights reserved.